A wood-derived absorbent that provides an efficient and scalable approach to the rapid clean-up of high viscosity crude oil. Slow and inefficient responses to oil spills have catastrophic and far-reaching implications for the livelihood of local populations and the environment. 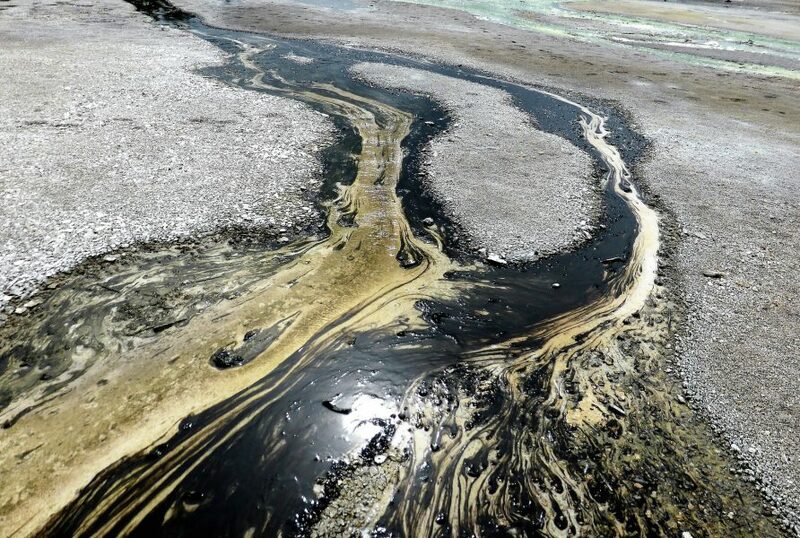 Although several oil remediation techniques have been proposed, they can have additional negative environmental impacts or demonstrate a low oil–water separation efficiency. Porous absorbent materials are considered a good alternative for oil recovery because of their capability to efficiently remove and recover oil from water. However, current oil recovery methods are applicable only for oils with a low viscosity. Previous research has found that joule heating is an effective option to reduce the viscosity of crude oil, but in-situ heating of an oil spill is energy intensive and thus difficult for large-scale application. Solar heating thus provides a cost-effective and scalable method for crude oil clean-up. A team of scientists from the University of Maryland have developed a wood-derived absorbent that provides an efficient and scalable approach to the rapid clean-up of high viscosity crude oil. 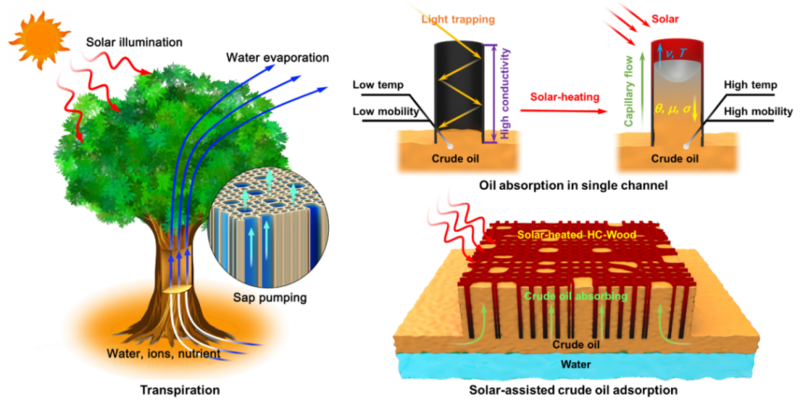 The solar-heated carbon absorber (HC-Wood) was inspired by the highly efficient and passive transpiration process in trees, with its aligned channels for rapid crude oil absorption. The unique porous structure of the absorber can extend the light absorption paths, guide the direction of heat transport, and decrease the resistance to oil flows, endowing the carbon absorber with highly efficient solar absorption, excellent thermal management, and rapid capillarity-driven oil absorption behavior. Compared with other solar-heated absorbers with a random porous structure, the HC-Wood demonstrates the following advantages: (1) over 99% of the incident solar irradiation weighted by the standard solar spectrum, which efficiently traps and absorbs light; (2) excellent thermal management, since the absorber can conduct heat with minimal loss from the top of the irradiated absorber down to the oil underneath; (3) a porous structure with low tortuosity, which enables rapid passive capillary absorption with low flow resistance; (4) a 10 times faster oil absorption rate than previously reported absorbers; (5) sourced from abundantly available materials and low predicted operational costs for large-scale production and application in severe, large-area oil spills. While the gap between the findings of the study and actual industrial practice remain a challenge, the work provides valuable guidance for the future design of high-performance solar-heated crude oil absorbents. “These results showcase the potential of a solar-heating technique for the efficient and cost-effective clean-up of crude oil spills in the near future, especially when combined with low-cost wood structures.” conclude the authors of the study.